When I was in the 5th grade there was a long line of See Saws on the playground that everyone loved to take turns on. I can remember that there were pebbles underneath the See Saws for the bottoms to land in, and if someone got off to quickly your end of the See Saw would hit the ground hard, and it hurt! That is why I love the See Saw Spinner. Not only is it a See Saw, but it also spins in circles! 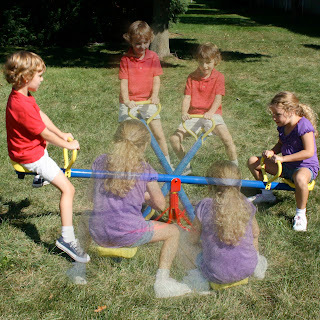 With kids wanting to spin in circles their feet will be constantly moving around the ground, preventing the one thing I disliked most, slamming the bottom of the See Saw to the ground! Another great thing about the See Saw Spinner is that it is made to be used in a residential setting! Bring home to joys of the See Saws at parks and playgrounds to your back yard!